I've said it before, Young M.A plays the "steal ya ho" card with the best of 'em. That's why BET asked her to provide their YouTube audience with a how-to guide designed to improve your chances of gaining her attention "Down in the DMs," as the segment is called. To start things off, Young M.A spoke about the kinds of messages she receives the most. Apparently, the general public has taken to referring as "Zaddy" something that appears to amuse her it nothing else. The majority of these messages come to her sprinkled in emojis; M.A listed the heart and the water splash as the two most frequently used - and under extremely dire circumstances the cat emoji, for reasons I shouldn't have to explain. Out of respect to user confidentiality, Young M.A only read the messages written in support of her bustling career (not the more explicitly-themed solicitations). M.A isn't offended by the more graphic displays that she encounters, but... if someone were to win her over behind friendly lines, they would have to "keep it classy," and most importantly, "you've got to be attractive." Young M.A doesn't waiver from her standards (like a below-par Player). 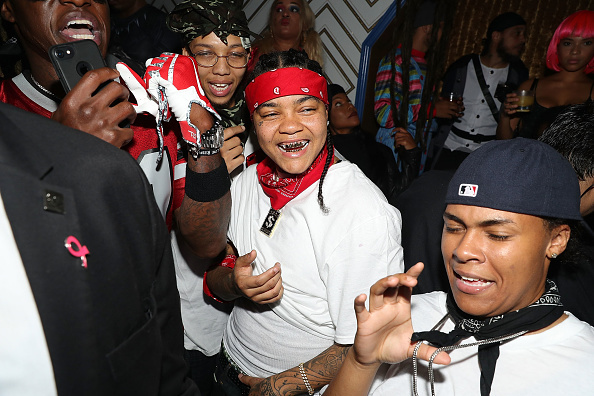 Young M.A admits that a wide range of "blue check" accounts hit her up on the regular. Although she didn't admit it freely, I recall a certain Bella Thorne taking her DM efforts to the front line. Mind you, there's no evidence to prove anything between the two women actually transpired. M.A did, however, allude to a few "hit it and quit it" type scenarios coming to fruition due to DM activity. Baby mothers, blue checks, men, and trolls alike have entered the mix, but the Brooklyn-native isn't about to list her body count out in the open. Check out the full segment below.